With never-before-seen documents accompanied by new reporting on Monday, The Intercept‘s Glenn Greenwald and Andrew Fishman are offering a more in-depth look than ever into how a secretive unit of the UK’s GCHQ surveillance agency used a host of psychological methods and online subterfuge in order to manipulate the behavior of individuals and groups through the internet and other digital forms of communication. demonstrate how the Joint Threat Research Intelligence Group (JTRIG), a unit of the signals intelligence agency Government Communications Headquarters (GCHQ), is involved in efforts against political groups it considers “extremist,” Islamist activity in schools, the drug trade, online fraud, and financial scams. 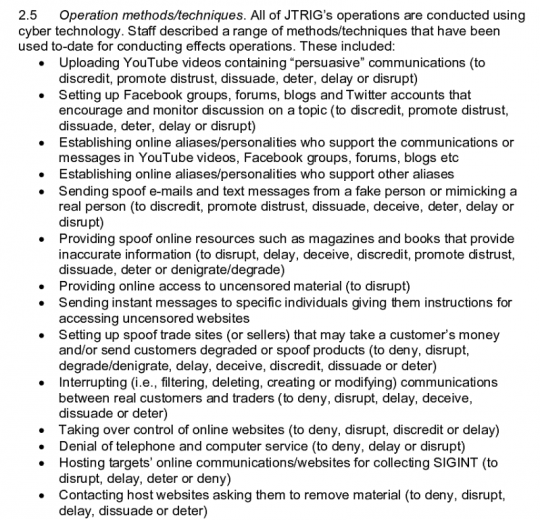 Though its existence was secret until last year, JTRIG quickly developed a distinctive profile in the public understanding, after documents from NSA whistleblower Edward Snowden revealed that the unit had engaged in “dirty tricks” like deploying sexual “honey traps” designed to discredit targets, launching denial-of-service attacks to shut down internet chat rooms, pushing veiled propaganda onto social networks, and generally warping discourse online. 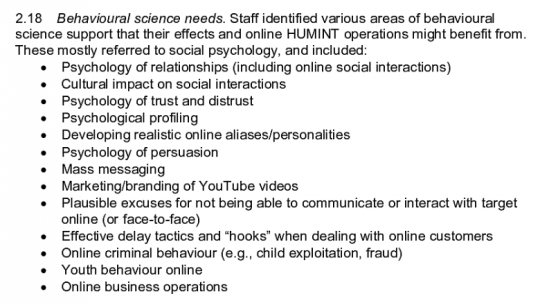 Among the most troubling revelations is a 42-page internal JTRIG memo that describes in detail how the elite unit developed, maintained, and apparently sought to expand its “scientific and psychological research into how human thinking and behavior can be influenced” in order to increase its ability to “manipulate public opinion” via online tools like email, social media, video, discussion forums, and other platforms. 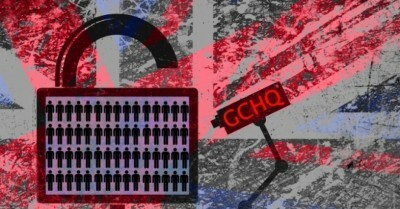 As Common Dreams reported in February of 2014—when the existence of JTRIG was first made public—the GCHQ has used the unit to develop and deploy a complex series of “dirty tricks,” “propoganda,” and “false flag” operations designed to spy on selected targets who included not only “suspected terrorists” and “criminals” but also diplomats, journalists, and activists.